"On Saturday 12 August 2017 the Eventim Apollo will open its doors to a multi-sensory extravaganza recreating the sights and sounds of India. Offering a fun filled day out for all the family, An Indian Summer will immerse visitors in the richness and vibrancy of Indian culture - plunging people into the backstreets of New Delhi and celebrating the heritage, styles and tastes of this South Asian Country. 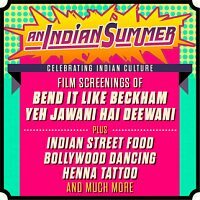 In the year that sees the celebration of UK-India Culture, An Indian Summer will bring Asian diversity to the grandiose setting of an iconic British venue. With the inside of the Eventim Apollo being transformed, visitors will be treated to live Bollywood dance performances, Indian henna artistry as well as a foodie fest comprising of Indian streetfood-inspired stalls both inside and outside the venue plus much more. The focal point of the inaugural event will be the screening of two much loved films that bring together the best of British Asian and contemporary Bollywood cinema. The day commences with a matinee screening of Gurinder Chadha?s evergreen, girl power sports comedy set in Southall, Bend It Like Beckham, starring Parminder Nagra, Keira Knightley, Jonathan Rhys-Meyers, Archie Panjabi and Anupam Kher."